Werner Herzog MasterClass, that’s right. Solidifying your skills is crucial if you wish to succeed in your career path. We just finished the course and it has been a truly enjoyable experience: Werner is not just an amazing director, but also a great teacher and knows how to guide you through the process to reach your goals. To be upfront, this blog post contains affiliate links. So, while clicking these links won’t cost you any extra money, we’ll get a commission from Masterclass which we then use to keep this site up and running. That’s ok, but who is Werner Herzog? When Werner was 19, he stole a camera and made his first movie. 70 films and 50 awards later, Herzog is teaching documentary and feature filmmaking. You’ll learn storytelling, cinematography, locations, self-financing, documentary interview techniques, and how to bring your ideas to life. By the end, you’ll make uncompromising films. There is so much to understand, so much to learn. “If you don’t read, you will never be a filmmaker” Herzog says. This is not a book about watching a bird, but a book about becoming a bird. The kind of immersion into the subject and the passion and the caliber of prose. It’s a book that everyone who makes films should read. Sometimes it’s good to leave your character alone so no one can predict what is going to happen next. These moments are often very telling and moving. At the same time he teach how to keep actors on their marks, favouring simple directions over extensive directions, knowing how to control your actors, hypnotising actors (Heart of Glass case study) and letting your actors loose. doing the doable, being the guinea pig for your crew, how to make catastrophes part of your story, how to deal with the unexpected. 4. YOU are the most important thing in filming. Not the gear. 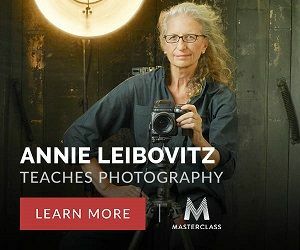 Leibovitz gave a similar advice in her Annie Leibovitz Masterclass (which we HIGHLY recommend if you are interested in a great photography course). “Never use your own money, unless you really really have to”. But if you plan and negotiate your terms right you shouldn’t have to. Negotiation skills: how to negotiate with producers and with conviction, how to handle lawyers, how to know what you’re getting yourself into, keeping the project urgent, warning signs of bad projects and signs of good working relationships. Just go ahead and DO IT. Don’t let bureaucrats or gatekeepers stop you. Take what you have, take the next step whatever it may be and MAKE YOUR MOVIE. 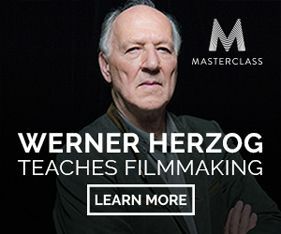 If you’re a filmmaker, film-lover, screenwriter, or storyteller and you’re looking for a solid investment that is highly educational, motivating, and entertaining, give the Werner Herzog Masterclass a try. You’ve got nothing to lose (Masterclass have a 30-day money-back guarantee) and a ton to gain. Enrollment now is officially available for this Masterclass. This class is treasure house to explore for those who wish to learn about filmmaking. What does the £85 enrollment fee include? Interested in joining this Masterclass? Get more info here! Riccardo is an award-winning film director, writer, producer living in London, UK. He actively promotes experimental filmmaking and is creating a network for a new generation of video artists and filmmakers. Check out Riccardo's website.